PDG Dennis Shreve, Youth Programs Coordinator and member of the Rotary Club of Harrison County, will be keeping us updated on the District’s Youth Exchange program. According to Shreve, July is a big month of transitions for Rotary Youth Exchange as we say “See You Later” to our 2017-18 inbound students, help our 2018-19 outbound student prepare for his year abroad and work feverishly to finalize paperwork, meet with Host Families, Youth Exchange Officers, Counselors and Host Clubs to prepare for the incoming exchange students for 2018-19. New Generations Service Exchange is a short-term, customizable program for university students and young professionals up to age 30 to travel to other countries to share ideas and leadership skills. Participants can design exchanges that combine their professional goals with a humanitarian project. 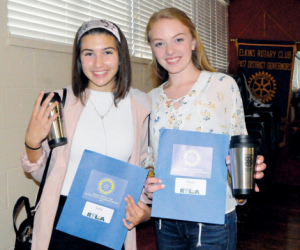 and District 7530 Rotary Youth Exchange News for July connections with service-minded community leaders in another country.